Product prices and availability are accurate as of 2019-04-13 00:19:25 EDT and are subject to change. Any price and availability information displayed on http://www.amazon.com/ at the time of purchase will apply to the purchase of this product. A convenient communications tool for a range of personal and home office applications, the new Fax UX-B750 is a compact, stylish Inkjet plain-paper fax with an unobtrusive footprint that works well in typical home or home office environments. Special attention to compatibility with home telephone usage lets it switch seamlessly between fax and telephone modes, allowing customers to receive fax and voice calls on a single line. 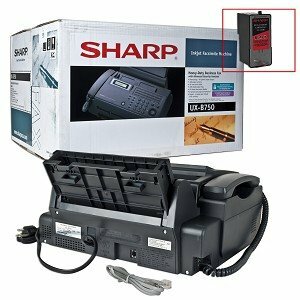 The latest in a generation of fax machines that are ideal for small business or office workgroups.